An op-ed in the Jakarta Post expresses concern (alarm?) over a new Legislative Institution Law, otherwise known as the MD3 Law, in Indonesia. I do not have enough background to understand all the issues raised in the piece, but one thing stands out. The author is worried that this is an effort by the majority coalition, opposed to the president, to “weaken the Indonesian presidential system”. Let’s be clear here, if the procedural aspects of the law really do empower a legislative majority that is opposed to this president, this doesn’t “weaken the Indonesian presidential system”, it strengthens it. A presidential system does not mean the president (necessarily) controls the legislature. It means the head of government is elected separately from the legislature and does not serve at the pleasure of the political majority. If the legislative majority asserts itself in dealing with the executive, that can be a good thing for institutionalization of presidential democracy. Indonesia’s presidential election: Divided government? Indonesia’s presidential election was earlier today–or yesterday, depending on where in the world you are. Both candidates are claiming victory, but contacts I have who follow Indonesia tend to put more credibility in the claims of Jakarta governor Joko “Jokowi” Widodo. Legislative elections were held in April, under Indonesia’s “counterhoneymoon” cycle. In those elections, the largest party emerged with 19.0% of the votes and 109 of the 560 seats (19.5%). That was Indonesian Democratic Party – Struggle (PDI-P), led by Megawati Sukarnoputri, and the party that nominated Jokowi. In second place was Golkar, with less than 15% of votes and 91 seats (16.3%). Golkar was the ruling party under the Suharto dictatorship, and is part of the coalition backing Jokowi’s rival, ex-general Prabowo Subianto. Prabowo’s own party is the Great Indonesia Movement, which won 73 seats in April (13%, on 11.8% of votes). The coalition supporting Prabowo/Hatta includes Gerindra [Great Indonesia Movement], PPP, PKS, Golkar, PAN, and Demokrat. The coalition supporting Jokowi/JK includes PDI-P, PKB, NasDem and Hanura. It appears that the Probowo coalition has at least 314 seats (56%), while Jokowi’s has 191 (34%). If Jokowi has won, Indonesia’s elections might be said to have produced divided government, in the sense that the coalition backing the presidential loser has a majority of legislative seats. However, such a conclusion exaggerates the importance of these coalitions. Indeed, the way I normally code a case of divided government would require either a single party or pre-electoral coalition formed for the legislative elections to have won a majority of seats. Given Indonesia’s electoral cycle, the coalitions formed only between the legislative and executive elections, and can be considered expedients dictated by electoral law. One can expect various parties in the Probowo alliance to defect and back the winner, in exchange for policy concessions, but more importantly for patronage. One indicator of how relatively unimportant party lines are in predicting Indonesian political behavior is that Prabowo was the vice presidential candidate in 2009 on the ticket headed by Sukarnoputri. Raising the threshold in Indonesia? An item in The Straits Times (Singapore) from 3 June, 2010, reports that there is a proposal in the Indonesian legislature to raise the threshold for representation from 2.5% to 5%. The article reports that there was a similar effort in 2008, but opposition from smaller parties stopped it. In the last election, in 2009, only one party obtained over 20% of the seats. Despite the “low” threshold, 18% of votes were “wasted” because they were for parties too small to clear the threshold. The next elections are in 2014. Another day, another big presidential democracy having an election. 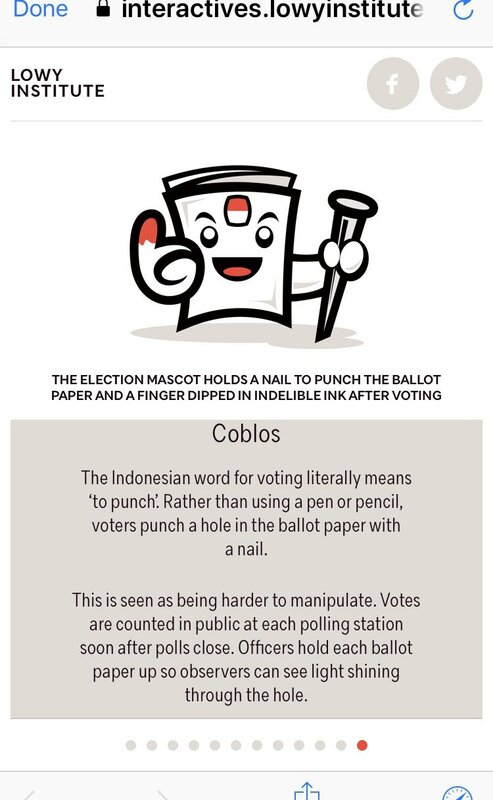 In this case, it is Indonesia’s presidential election. The country had (counterhoneymoon) legislative elections earlier this year, which saw a high degree of fragmentation. To be elected president in one round, the leading candidate must have over 50% of the nationwide votes and 20% in at least 17 of the 33 provinces. Otherwise, there would be a runoff in September. However, as the polls open there is not much suspense, as it appears certain that Susilo Bambang Yudhoyono is set to become Indonesia’s first democratically reelected president. More than 19 million votes, or 18 percent of the total, were “wasted” because they went to the 29 parties that failed to make it to the House. Well, the new threshold ‘worked’–at least in its ‘mechanical’ effect. PD is the only party to have passed the minimum threshold of 20 percent of House seats to earn the right to nominate their candidate, the incumbent President Susilo Bambang Yudhoyono. He will still need to form a coalition with other parties, if not to pick a running mate from, at least to beef up his party’s strength in the House. The combination of Golkar and Hanura ensures they have the right to field their candidate, most likely Jusuf Kalla, Yudhoyono’s estranged Vice President. The PDI-P of former president Megawati Soekarnoputri is still working to forge its own coalition. One party over 20% of seats, even with all those wasted votes. Now that’s fragmentation!